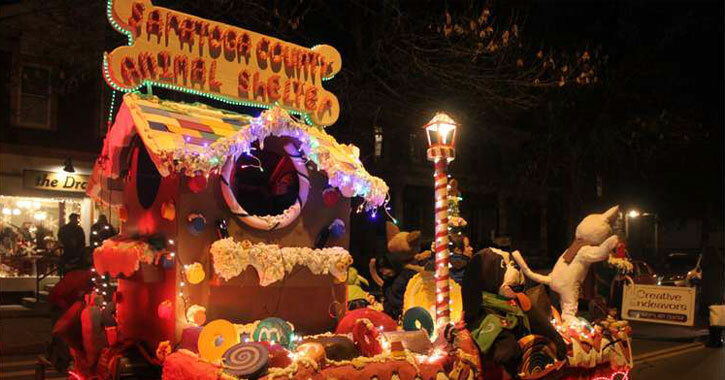 The annual Ballston Spa Holiday Parade is happening this weekend! Find out what other holiday events are worth checking out throughout the Capital Region, from a holiday-themed 5K in Halfmoon to a Victorian Stroll in Troy, and much more. The annual Ballston Spa Holiday Parade is taking place this Friday, which also happens to correspond with First Friday. The parade will culminate at Wiswall Park on Front Street with Santa lighting the Christmas tree. Head to Albany on Sunday for the annual tree lighting at Empire State Plaza, along with Santa, a holiday arts and crafts show, skating demonstrations, fireworks, and more holiday fun. The Schenectady Festival of Trees starts this weekend and runs through the 23rd at the Schenectady County Historical Society. Tickets are $5 for adults and $2 for kids, with children under five free. Saratoga’s Festival of Trees is taking place at the Saratoga Springs City Center Wednesday of this week through Sunday. In addition to decorated trees, there will be wreaths, centerpieces, and other holiday items on display. Clifton Park Town Hall is once again forwarding letters from local kids to North Pole. For a personalized reply, include a self-addressed stamped envelope and mail or drop off the letter by December 18th. Letters can be dropped off at Santa’s mailbox in the lobby at Clifton Park Town Hall or at Clifton Park Center near Santa himself. The Jingle Bell Run/Walk is happening at the Halfmoon Town Park, with all proceeds going towards the Arthritis Foundation. This is a fun, holiday-themed run or walk where participants get decked out in holiday costumes. Don’t miss out on the Troy Victorian Stroll happening on Sunday – there will be juggling acts, carolers, musicians, entertainers, ice sculptures, decorative displays, people dressed in Victorian attire, and more. The Empire Skate Plaza opens for the season in Albany this Friday. Remember, it’s free to skate and rentals only cost $4 for adults and $3 for kids.